Mark went to be in the presence of his Lord November 27, 2008. His death was due to complications of his ALS (Lou Gehrig’s disease.) Mark was born Jan 15, 1955 to Louis and Delores Riddering in Evergreen Park, Illinois. As a young boy, he moved to Oxnard, California with his family. He graduated from Oxnard High School in 1973 where he excelled in swimming and water polo. Mark married his wife Sue in 1975. While working as a police officer, he completed his B.A. in criminal justice through the University of La Verne. 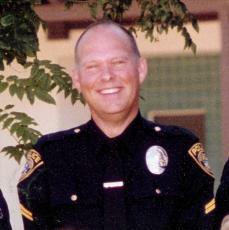 Mark began his police career in Port Hueneme, California. He later worked for Ventura P. D. and Oxnard P. D. In 1989, he was hired by the Santa Maria Police Department, where he worked until his medical retirement. Mark’s thorough enjoyment of his career led him to being a highly decorated police officer. While working in Santa Maria, he was instrumental in starting up the DARE program in schools. He worked in patrol and as a detective, but his passion was narcotics enforcement. His love for his work showed in his often having dreams of being on the job for years into his retirement. Even more than the work, though, Mark loved the people he worked with. Mark and Sue had four children together. It was for his wife and children’s benefit that he moved the family to Nipomo, to enjoy the country life. As a father he was able to balance justice and mercy. He was also a great playmate, taking his kids to the beach and running around the backyard. Mark always put his family first and his children always knew how important they were to him. It gave him great joy to see who they became as adults. Mark was raised in a Christian family, and he continued strong in his faith in Jesus until the end. He was a member of Redeemer Presbyterian Church in Santa Maria. God upheld Mark and his family faithfully throughout Mark’s illness, which gave him the hope and the joy evident to all who knew him. Mark was passionate about showing people how good his God is. Mark’s confidence in going to Heaven to be with his God was based on his belief in Jesus to save him from his sins. Mark is now joyfully with the Savior he sought to faithfully serve. Mark is survived by his faithful wife Sue of 33 years, his children and their spouses: Sara and Ben Brigham, Rebecca Riddering, Samantha and Kevin Brandon, and Luke and Christina Riddering. He had four grandchildren: Seth and Hana Brigham, Karis Brandon and Mark Riddering. He is also survived by his mother Dee, his older brother Wayne Riddering (DeDe), his younger sister Lynn Mackereth (Jim), his mother in law Connie Foss and his 3 brother in laws, Ken (Jan), Andrew (Diane) and Richard Foss (Jan), and numerous nieces and nephews. Mark treasured his friends and will be remembered by many. The family is extremely grateful for the support of the entire Santa Maria community throughout Mark’s illness. Mark’s many family members, coworkers and friends helped tremendously with the special challenges presented by his illness. The family requests that in lieu of flowers, donations be made to the Mark Riddering fund at Rabobank (effective Monday). This fund will go to charities close to Mark’s heart. Services to be held at First Christian Church in Santa Maria, Tuesday December 2, 2008 at 1:00 PM, graveside service and reception to follow. While we mourn Mark’s passing, it is rather a time of great celebration. He is now pain free and in the presence of our great God and Savior, Jesus, the one who Mark so faithfully loved even through his journey or pain. But he was faithful to the end and has received the crown of life that awaited him with joy unspeakable and full of glory. We rejoice in God’s great mercy and love. May God bless you all (family) and comfort you in your loss by the knowledge that Mark walks with the Savior he so loved and you will soon see him and Jesus face to face. Precious in the sight of the Lord is the death of one of His godly ones. I am so sorry for you loss. I can’t remember when I last checked on Mark, but as always his responses were always indicative that he was thankful for another day and always saw the best in his given situation. We became re-aquainted a few years ago. I was very young when I worked with him at OPD, gosh I think I was a few years out of high school. But I do remember that he was a kind and gentle spirit. I will miss our emails. I will keep your family in my thoughts and prayers. I pray that you have an abundance of peace knowing that Mark is no longer suffering and he is finally resting in the place he has waited so long to be. I am certain God received an angel with Marks passing. He is with our Lord, without a doubt. In fact I am certain be got an “E-Ticket” ride straight there! she would tell me of Mark’s final Homecoming. many Angels, singing God’s praises! Mark and I went thru grammer school at St.
the front row, right under the teacher’s nose. the biggest teddy bear I have ever known! be such an inspiration to so many people. together forever with our Savior! I am so thankful for the joy that Mark has brought into my life. Everytime I’ve visited with him, he has encouraged me. I love you guys and I will keep you in my prayers. I saw the news last night…How fitting is it that Mark would meet Jesus face to face on a day set aside for thanksgiving? I still cried for Mark, but I’m rejoicing for him and can just imagine him running towards Jesus. My 4-year old daughter saw my tears last night and asked me why I was crying…I told her that “daddy’s friend went to be with Jesus”…she looked at me with a look of curiosity and said “So, why are you crying?” True wisdom comes from the mouth of babes. I am so sorry that I can’t be at Mark’s memorial service. I’m starting a federal civil rights trial on that very same day, but I will make sure that I think of Mark as I protect two deputies from the allegations made against them. Jesus used Mark to make a BIG imprint on my life and I am so thankful that I knew him and that he was my mentor and friend. I will keep praying for you as you make this major adjustment…I’m really looking forward to seeing Mark again someday. I love you! I can’t even say what I am feeling right now. You are one of the greatest men I have ever know in my life…2nd only to my dad Scott. Oh the great memories I have of you and our families together. Your inspiration in my life gave me the drive to join the military. From the adventures of driving as if on high speed pursuit during carpools to elementary school to jumping off the sand dunes in Nipomo to Sami getting sick in the van and you holding your large right hand out as she vomited in it…..I cant stop thinking about the strength and love and gentleness you had toward everyone you touched. You were always in my thoughts and will continue to always be. Thank you for being such a great man! You not only were a great father to your children, but came into my life as a man I could always look up to..
We are celebrating His presence with our Lord and Savior and only wish our own journey here on earth can be a blessing to others as His was to us. We just got back from traveling and heard of Mark’s Passing on to a place prepared for Him by our Savior and though we will miss Him we are sure He is in the mighty hands and magnificent presence of our Lord and Savior.His courage and love for the Lord has been a blessing to us and by God’s grace we look forward to being with Our merciful Savior when He calls. May God bless His family and cause His face fot shine upon them and may our every thought word and deed be according to His perfect will.We miss Mark tearfully and pray we see His family again some day soon. I am a distant cousin of Mark’s and his story really touched my heart. It seems to me that he remained strong through his long battle. I am sure that it was hard for him to leave a job he seemed to love. My father is a retired police officer as well. My parents are the same age as both Mark and Sue and they seemed to have the same close bond that my parents share. I wish I would have gotten the change to know them. I am sure he was a wonderful person. I am sorry for your loss. Many thoughts are prayers to your family. Andrea Janota from Chicago IL.